Richard (Scott Chambers), a 15 year old boy with learning difficulties, lives a solitary existence in a squalid caravan with his restless and volatile brother Polly (Morgan Watkins). Nature and the animals around him are his only company. Some, like his beloved chicken Fiona, are alive. Others are dead but Richard nurtures them nonetheless. When a new family moves into the farmhouse nearby, Richard makes an unlikely human friend in their teenage daughter, Annabell (Yasmin Paige). However, when Polly loses his job and the electricity to their caravan is disconnected, Richard's very existence is put at risk. The opening scenes of Chicken are really beautiful. We see Richard walking through fields on a sun dappled day and cannot help but fall in love with his outlook on life. Sadly, this rather idyllic backdrop does not last long. Soon we are introduced to Richard’s desperate living situation: a rundown caravan in a field. Still, Richard makes the best of things - cobbling together heartbreakingly meagre breakfasts for Polly (a brilliant performance from Morgan Watkins). Unfortunately, his best efforts are rejected, leaving Richard alone with only Fiona to care for and confide in. Thanks to Scott Chambers’ superb, note perfect performance, Richard captures our hearts. We desperately want someone to rescue him - before our worst fears are realised. 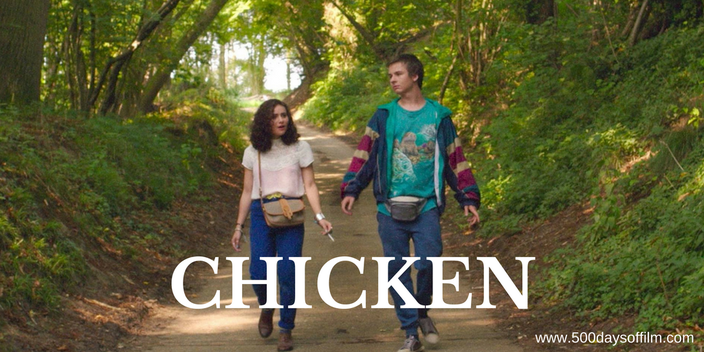 Chicken is a deeply upsetting film that moved me to tears on more than one occasion. Its devastating portrayal of neglect and deprivation reminded me of films by the likes of Andrea Arnold and Ken Loach. As Joe Stephenson's film (adapted from Freddie Machin’s play by Chris New) moves forward, an unsettling feeling of dread descends - culminating in a final act full of darkness and truly heart wrenching scenes. However, Chicken is not an unremittingly bleak experience. Richard’s chats with Fiona and his burgeoning friendship with Annabell inject some much needed lightness, humour and hope. Again and again I was stunned by Chambers’ powerful portrayal of Richard - a truly remarkable performance that will stay with me for a long while to come. If you have, what did you think of Joe Stephenson’s film? Let me know by leaving a comment in the section below.